To use TheraNest successfully we suggest utilizing all of the parts and pieces of TheraNest. The three main parts are the Calendar, Billing, and Notes. Continue reading to see how these three pieces connect. It was designed this way to keep you accountable for workflows and business processes. It will also help you succeed through an audit. The Calendar is where this workflow should begin. On the calendar we do have appointments but those appointments are much more than blocks of unavailable time. It's your proof of service. The appointment has your Client, Service Date, CPT code, and the time/length of your appointment. 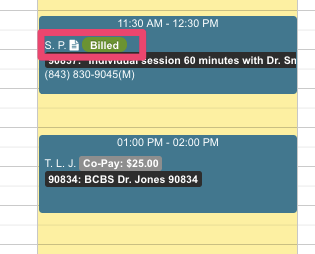 Your calendar appointment determines what your client will be billed for when you create the invoice. When you created your Service Types you selected a time unit for that service type. Always bill for x units of this service per session does not take into account the start/end times of the appointment on the calendar. It will always bill for however many units you type into the box. When you create the invoice it will take the number of units in the box and multiply it by your rate and that will be the invoice total. This time unit is best used for non-cpt code service types such as late fee, book, convenience fee, etc. Bill 1 Unit for every x minutes spent on this service during a single session looks explicitly at the start and end times of the appointment on the calendar to determine how many units to bill for. The number of units will be multiplied by your rate and will be the total of the invoice. Next in your workflow will either be creating invoices or creating progress notes. It will be up to you to determine which workflow works best for your organization. Some organizations take payment at the time of service so they create invoices before they create notes. Some organizations are out in the field so they write their notes before invoices are created. There is no right or wrong way to do this but it's important that all three pieces are linked together in the end. When billing for a date of service you should always make sure you're creating that invoice correctly. Using Batch Invoicing or creating the invoice on the Agenda is a great way to insure this. When you have successfully created an invoice for a date of service you'll see the date of service as a blue hyperlink on your invoice screen. If you click on the blue hyperlink on your invoice screen it should direct you to the calendar. The appointment will have a green indicator tag that says, "billed." This is how you know you have billed correctly within TheraNest and is another proof of service for you to have. 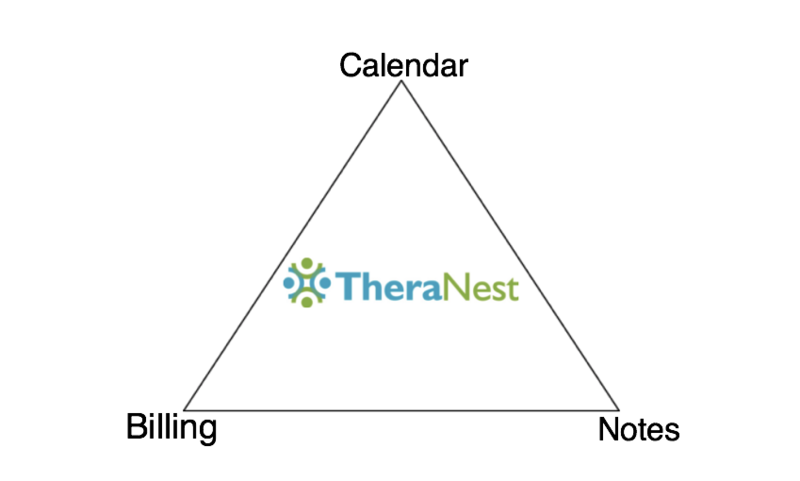 TheraNest's progress notes are clinical documentation of the sessions you have held with your client. They exist on a client's case which can only be accessed by TheraNest administrators or the assigned staff member aka clinician. It is important to know that Custom Forms cannot replace Progress Notes. You can create your own custom form to be your progress note, but to TheraNest it will not recognize it as a progress note. Custom Forms are there to capture any additional information you may need that is unique to your practice. They are best used as a supplement to the TheraNest template. Progress notes also need to be linked to appointments to pull in all information as an additional proof of service but also to pull in additional information about the session. Adding a progress note from the agenda automatically populates the appointment details for you in the note. Also, adding a progress note from the missing progress notes report will be successful as well. These are the ideal ways to add a note. If you add a note in any other way you'll need to manually change the date of service and then choose the appointment from the drop down. In the image below the pink fields that are populating on the printed progress note are specifically pulled from the linked appointment. If the note was not linked to the appointment this information would not pull in. The blue field is the Place of Service field and is actually a billing field. You can set this on the progress note but if your clinician does not have billing permissions they will be unable to. The place of service will populate over from the created invoice. When the invoice and the note are linked to the same appointment information can move freely between the two. This definitely comes in handy when creating Superbills for your clients as well. Superbills need to include a DX code which actually lives on your note. When the invoice and note are linked to the same appointment the DX will show on the superbill properly. You can always look at your calendar to see if your appointment has a note and an invoice linked to the appointment. A small note icon will be present as well as a green "billed" tag. To find all appointments without an invoice use Batch Invoicing. You can set your date range and it will pull all appointments that do not have an invoice associated. You can also find all appointments missing a progress note by using the Missing Progress Notes report.